Every city should have a restaurant like Range. Why? Because this is a restaurant which displays intelligence, flair and conviction, and its objectives are admirably limited. Those objectives are to serve intensely enjoyable food (of the simpler, non-faddish kind), to offer carefully chosen wines, to create a relaxed, friendly atmosphere for a pleasant dinner and to take part in the reclamation of a locality which has been less than fashionable. On all counts, Range succeeds brilliantly. 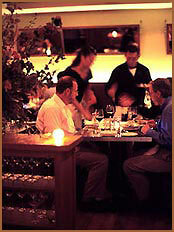 It was opened in San Francisco by a husband and wife team in 2005. Its cuisine is described as ‘new American’. It is modest in size, with just 70 seats. Its décor has an industrial theme, with a bar-top made of polished concrete. It has banquettes of brown leather. It has been awarded a Michelin star. And the Michelin inspectors are absolutely right to be impressed. The Mission District of San Francisco still has enough ‘interesting’ persons about its streets to deserve the epithet ‘colourful’. You must certainly go to it by taxi, rather than by public transport. But signs of its increasing social status are everywhere. And chief among them must be Range. Its exterior is smart, but it is possessed of a charming modesty. And this, I suspect, gives us the clue as to why it is so highly regarded. A lesser place would be more pretentious in all sorts of ways, but here there is the self-confidence which does not need to shout. The people at this restaurant know that their food is based on fine ingredients, simply and expertly cooked, and that they are involved in an enterprise with high standards. They are proud of what they are doing. I felt this as soon as I walked in, to be greeted in the friendliest of manners. Clearly, credit must be given to Mr and Mrs West, Phil and Cameron, who clearly know how to run a restaurant. I went through the front bar and down a corridor, past windows into the kitchen, and found myself in the rear dining room. I had been put on a corner table, which was important for me, for I am a little hard of hearing, and I knew that in this crowded and busy chamber, with its metal-topped chairs and beamed ceiling, I would have difficulty in conversing with my companion if we were obliged to sit opposite each other, which is how many of the tables are arranged. Range is justifiably popular, so this is something you might wish to discuss when booking. Sue, our wonderfully pleasant waitress, was all smiles. And so was I. Thus comfortably settled, I examined the decent glassware (by Stölzle) and appreciated the absence of canned music. This is the sort of dining room which is so often ruined by the damnable canned cacophony which some idiots think is the sine qua non of a popular restaurant. Mr and Mrs West are to be congratulated for knowing better. The finest accompaniment to good food is pleasant conversation, which is only hindered by having to endure someone else’s execrable taste in music. I liked both the subdued colour scheme (of brown and green) and the uniforms of the waiting staff (black shirts and white aprons). The crusty bread was exceptionally good. I also approved of the diligence with which the waiters and waitresses re-folded the napkins of those guests who left their tables for a moment. The menu at Range is market-driven and therefore changes each day. You will note that the menu card is dated. This is exactly how it should be in a restaurant of this sort. Mr West is a chef of real talent. 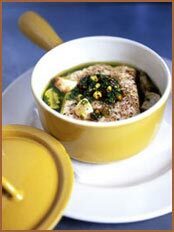 His unfussy, direct approach reveals the true tastes and textures of his ingredients. But there is subtlety here, too, in the careful combinations on his plates. It would be very difficult indeed not to enjoy this cooking. I began with a beautifully presented salad of carefully balanced ingredients: the figs were wonderfully sweet and combined simply and harmoniously with the goat’s cheese and walnuts. Note that I remark on the presentation. There is a painterly eye at work in the kitchen here, and its influence heightens the enjoyment of the diner. Next came another starter – roasted pork belly with escarole, red flame grapes and rosemary. The balance of soft and crunchy textures was brilliantly judged. This looked so easy, but this is Art which conceals its art – which is why so many kitchens try and fail to produce these results. The wine list is short – with around 80 bottles and about 20 wines by the glass – but interesting, with a mixture of offerings from the New and Old Worlds . Prices range from $34 for a sauvignon blanc from Santa Barbara County to $388 for a 2006 grand cru red Burgundy (‘Clos du roche’, Rousseau). I drank two splendid half bottles. The 2009 Talley chardonnay from the Arroyo Grande Valley ($28, half) was just the blend of vanilla, butter and alcohol I wanted. And the cabernet/merlot from the Santa Cruz Mountains (Ridge, 2007 - $40) was superbly complex, with notes of plum, cherry, cedar, leather, blackcurrant and even raspberry. If you are sensing that I enjoyed this drinking as much as I enjoyed this food, you are sensing correctly. The residents of San Francisco are lucky to have this dining room. It knows what it wants to do, and it does it – with modesty, charm and diligence. 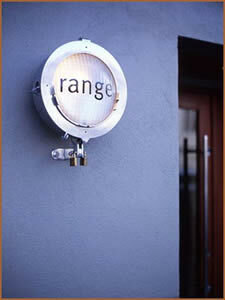 In an ideal world, every city would have a restaurant like Range. 842 Valencia Street (between 19th and 20th Streets), San Francisco, California 94110, U.S.A.